Being that it is the last day of April, its time to showcase some inspirational sites to get those creative juices flowing. Since the majority of the readers here are web designers/developers, I decided to showcase the most Inspirational websites from the URLs you left on your comments this month and I found three inspirational websites. If you think I your site should be on this list then please comment or contact me. 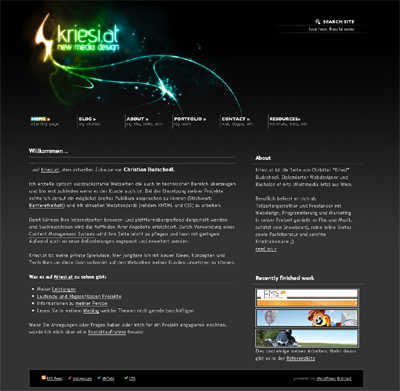 Kriesi.at – Kriesi.at is a great looking site by Christian Budschedl. The site has a great looking header and the navigation bar is just stunning. Also on the blog page which is half in english tells you how to accomplish the navigation effect. 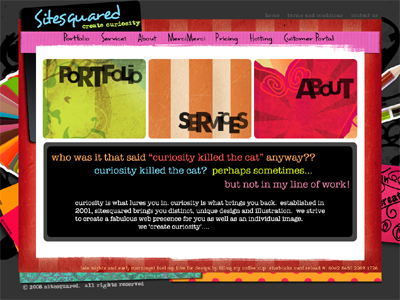 SiteSquared – Sitesquared which is designed by Shanna is a very artistic website. SiteSquared has a very nice navigation bar with a cool hover effect. If you are looking for some inspiration you should check this site out. Niall Doherty – Nial Doherty website is very unique. The home page is a horizontal scrolling website. The site is built on WordPress and uses the jQuery framework with the coda-slida plugin. It is a very unique website that you must check out. I am going to be doing this once a month if it is well recieved. If you want to be considered please contact me or comment any time during May 2008. What about my site ? wow!! I am totally honored that you would choose my site as inspirational. Thanks so much! You have made my week! Thanks for providing such a good sites.